Ankle sprains are caused by an unnatural twisting or force on the ankle bones of the foot, which may result in excessive stretching or tearing of one or more ligaments on the outside of the ankle. 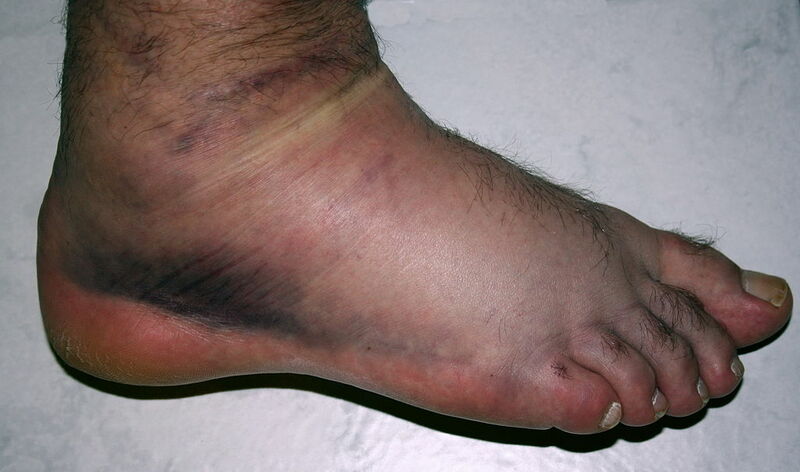 The severity of the ankle sprain can impact the degree of damage as well as the type and duration of treatment. If not properly treated, ankle sprains may develop into long-term problems. The job of the ligaments is to hold the ankle bones and joint in position. The ligaments protect the ankle joint from extreme movements like twisting, turning, and rolling. But when your foot moves at an extreme angle relative to your ankle, the intense force causes the ligaments on the outside or inside of your ankle to stretch beyond their normal capacity. The damage can be microscopic tearing of the fibers in the ligament, or a complete tear of the ligament. The result is pain, swelling, and bruising. Ankle sprains are not to be taken lightly, because if left untreated, they'll weaken the ankle, making it more likely that you'll injure the ankle again. Repeated sprains lead to arthritis, long term pain, and weakness in the ankle joint. Ankle sprains come in three grades, based on how badly the ligaments are damaged. Symptoms and treatment vary according to how serious your sprain is. Treatment of all ankle sprains involves rest, icing, and elevating the injured ankle. Over the counter pain medicine is usually sufficient to control pain.